The Hardy Boys' WWE Smackdown Tag Team Championship win over The Usos on last night's episode of Smackdown resulted in a brand new betting market - which was first published yesterday afternoon - to be immediately settled. 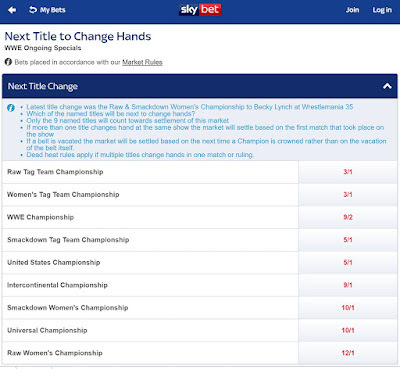 Sky Bet launched a new special where customers could place wagers on the 'Next Title To Change Hands'. 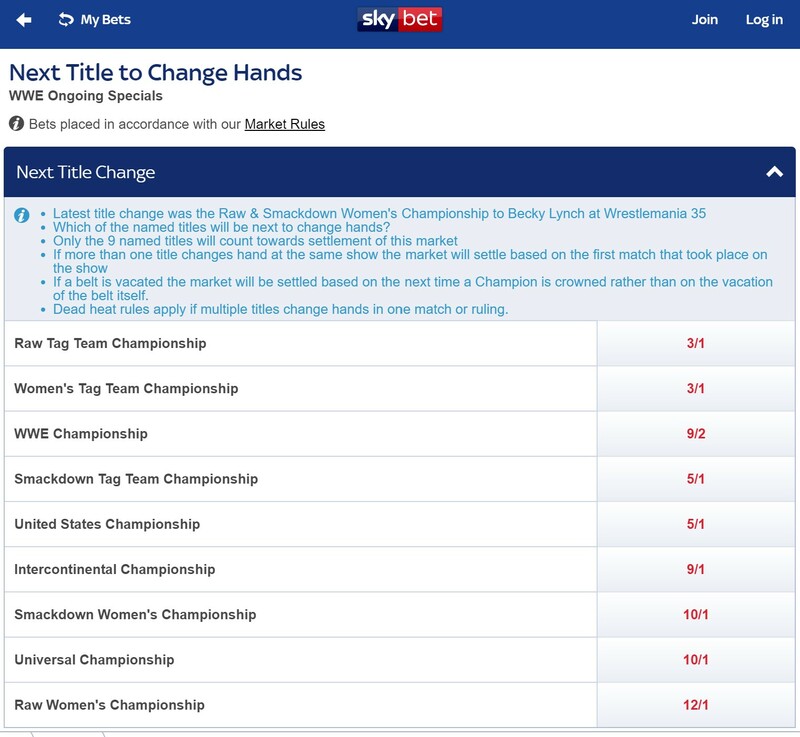 The bookmaker priced up a list of WWE's championships and the punters could gamble on the title that would next switch to a new champion. When I first came across the market, I thought the 'Smackdown Tag Team Championship' selection at 9/2 was worth a bet because I had a feeling The Usos will end up being moved to Raw in next week's Superstar Shakeup and - to make it a perfect transition - they'd have to drop the titles either on last night's show or the following week's. An hour or so later, somebody showed me a tweet from WWE announcing that The Hardys would face The Usos for the straps and so I looked back over the market to see that the selection had been cut to 2/1. It fell further from there. As you can see in the table below, I visited a few more times before the market closed at 11PM BST. The closing price was EVS to the eventual winner. The market was restarted today with the WWE Raw Tag Team Championship a 3/1 joint-favourite to be the next title to switch holders. Unlike yesterday, I haven't got a strong opinion on which title could be next to change but - with that said - it does make sense to me seeing the Raw tags at the top considering Zack Ryder and Curt Hawkins won the straps from The Revival for the WrestleMania moment. I don't think I'll put my money where my mouth is on it, though! The other favourite is the Women's Tag Team Championship. This makes sense considering Paige revealed on last night's show that she was bringing in a tag team to challenge Billie Kay and Peyton Royce. Here's how the market looked when I first came across it at around 9:20AM today. The Hardys' win has also resulted in the 'Champion After The Usos' market to be settled in favour of the new champs. The eventual winners were 11/10 favourites in the market when I first looked on March 11th and were 5/4 last night, but they were at longer odds leading up to WrestleMania 35 because they weren't in the title match on the show. For example, they were 8/1 this past Sunday afternoon. The new 'Smackdown Tag Team Champions After The Hardy Boyz' market has three 3/1 favourites. They are Aleister Black and Ricochet, The Bar and The New Day.